Engineered from optimum quality raw material, our array of PIV Chains is designed in compliance with international standards. Available as per English 8, German, Czechoslovakia Standards, our wide marketing network enables us to fulfill the client’s requirements with the utmost efficiency. Ring Roller Bearing P.L.V. 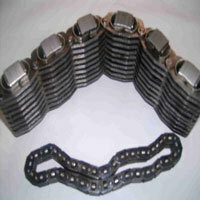 Chains are also available as per the requirement of our clients. Looking for PIV Chains ?